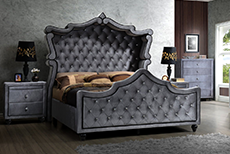 Universal Furniture is giving the American furniture industry a run for its money! They provide individuals and families with superior furnishings that are not only reflective of the current trends but manufactured with superior materials sourced to View more last. However, unlike most companies that outsource their manufacturing overseas, Universal remains a proud Asian company. In the 1970’s, their founder realized that he could combine the surplus of Chinese timber with American manufacturing methods to create traditional, stylish furnishings for import to North America. The result has been years of providing Americans with exceptional furnishings for the whole home at steep discounts. Universal Furniture is giving the American furniture industry a run for its money! They provide individuals and families with superior furnishings tha View more t are not only reflective of the current trends but manufactured with superior materials sourced to last. However, unlike most companies that outsource their manufacturing overseas, Universal remains a proud Asian company. In the 1970’s, their founder realized that he could combine the surplus of Chinese timber with American manufacturing methods to create traditional, stylish furnishings for import to North America. The result has been years of providing Americans with exceptional furnishings for the whole home at steep discounts.